How can strangers across the world connect so quickly and deeply with each other? Deep bonds can often come through tragedy or through shared values. In Michal Weinstein’s case, it was both that connected her to the Fuld family in Israel, and will continue to keep them bonded. After learning of the devastating news of the tragic murder of Ari Fuld HYD in Israel in September, Weinstein, a graphic designer and event planner, created a unique graphic image, a “Lion of Zion” to represent Fuld’s legacy. Weinstein had only met Fuld over a year prior, after being in touch about potential fundraising for his Standing Together organization, but was immediately impressed by his cause. An outspoken supporter of Israel, Fuld was connected with countless others around the world. Active and beloved in his community of Efrat, and originally from Queens, NY, so many people knew him personally. Fuld’s actual reach was far greater, as he touched countless viewers through his heartfelt videos on social media. Last week Weinstein had the opportunity to finally pay a personal visit to Fuld family. It was a deeply meaningful culmination of the whirlwind that has occurred over the past few months since Ari Fuld’s death. In the days before Yom Kippur, Weinstein launched the Lion of Zion campaign, selling Sukkah posters, magnets and kippahs all imprinted with the logo she had created in Fuld’s memory. 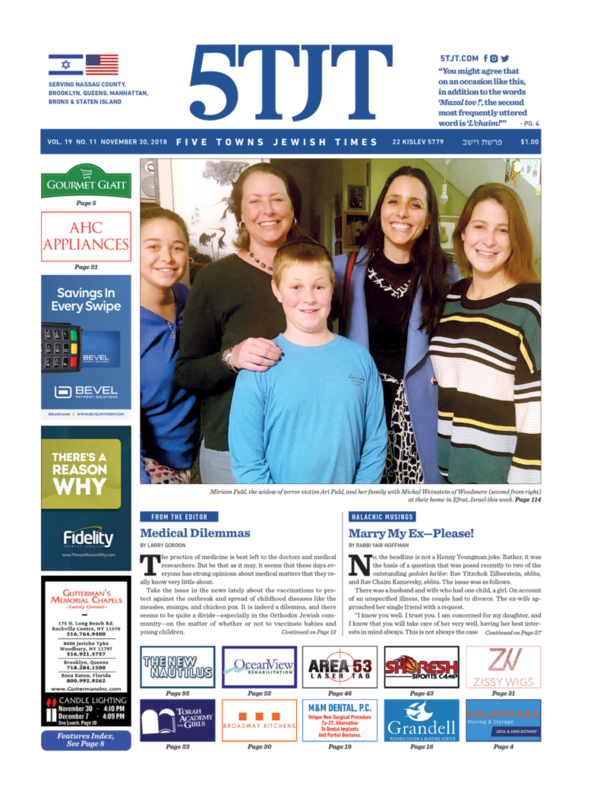 Through the power of her own social media platforms, and with a network of like-minded community members, Weinstein has raised a total of $45,000 to date and she presented the most recent funds to Miriam Fuld in person. Weinstein had been contemplating making a trip to Israel to celebrate a friend’s bar mitzvah celebration when she received a call from Steve Gar. Referred to as “Israel’s Jack Bauer”, Gar is a distinguished soldier and counter-terrorism expert from the Gush Etzion region. He had called to ask Weinstein’s permission to use the Lion of Zion logo as a symbol for the new settlement being established in Fuld’s memory. Coincidentally, the bar mitzvah in Israel was set to include a tour of Givat Eitam – the very same hilltop settlement that Gar was asking about; Weinstein took it as a sign and immediately booked a flight out. When Weinstein and the tour group arrived at the settlement, the sight was indeed a scene to behold. An Israeli flag adorned the otherwise barren hilltop. There is no running water and no electricity. The young men, and one married couple with two young children, live in tents and caravans. Givat Eitam sprouted in the days after Fuld’s murder. Fuld’s students and supporters headed to the hilltop that Fuld had dreamed about establishing. Some of these courageous pioneers arrived immediately after his funeral. Gar explained to the group that the site, just down the road from Fuld’s home, is very special and mentioned in Tanach and the Gemara Yerushalmi. According to the sources, Har Eitam was considered as one of the possible spots for the Bais Hamikdash, and like Har Moriah, it is too not the highest mountain. After the tour Weinstein had the privilege of meeting with Miriam and her children at her home in Efrat. After spending the last few months devoting her time and efforts to the Lion of Zion campaign, being able to see the family and all the tangible progress made in Ari Fuld’s honor was surreal. Weinstein’s campaign had raised $11,537 in kippah sales alone. Miriam requested that this check, as well as any future donations, go towards the Standing Together organization for Ari’s unfinished projects. One of Fuld’s main objectives and biggest pleasures was to provide comfort to the soldiers of the IDF. His recent goal was to build a “hospitality truck” – a mobile respite center equipped to provide amenities to 3,000 soldiers. The new ten ton truck will be able to provide ice cream and cold drinks and will be outfitted with a popcorn maker, a waffle machine, a pizza oven and more. While the two women had never met before, the connection was evident. The Fulds’ door was covered with Lion of Zion magnets and the images were proudly displayed inside their home as well. Weinstein got to see the Medal of Valor awarded to Fuld after his death. Weinstein presented Fuld with the check in person along with another gift – an acrylic piece featuring the image. “That was an emotional moment for both of us,” admits Weinstein. Weinstein quickly utilized her resources and contacts to bring the idea to fruition, and offered the posters for purchase in her local Five Towns community. Within mere hours, working the day before Yom Kippur, Weinstein had secured printers and distributers in New Jersey, Florida, California, Colorado and Israel. The campaign spread like wildfire, largely through the power of Facebook, and posters began selling out as fast as they became available. Hundreds of posters were sold in the few days leading up to Sukkot, with 100% of the profits going towards the Go-Fund-Me page set up in support of the Fuld family. 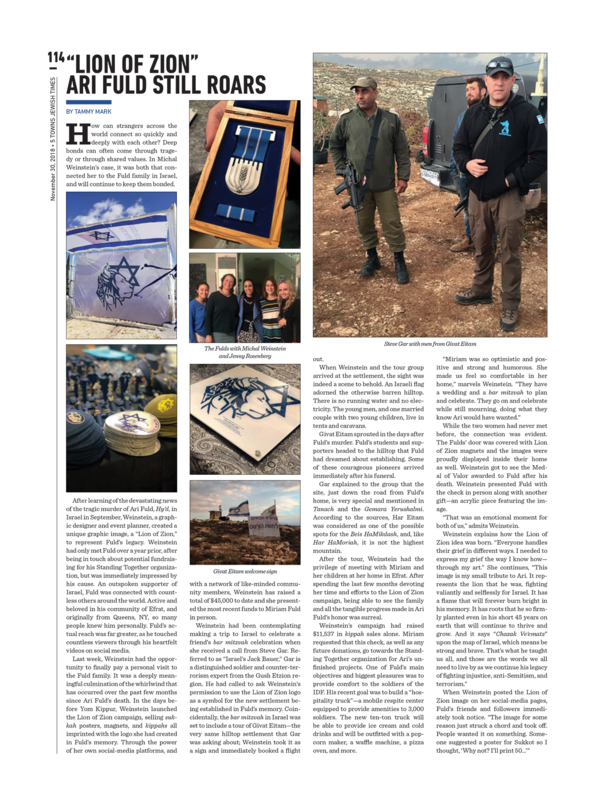 Weinstein then created kippahs with the image in blue and white and the green and gold of the Israeli Defense Forces; 500 sold in the span of one day, with requests for shipment to Canada and Israel. Weinstein created magnets with the image as well. The hashtag #lionofzion soon populated the internet along with pictures of the image proudly displayed in Jewish communities across the U.S. and Israel, all in tribute to Fuld’s legacy. Plaques with the image were created as well. A video circulated with Ambassador David Friedman being interviewed as his poster hung in the background. One of the most touching moments was when Weinstein found out that Ari Fuld’s daughter Naomi painted the image on the family’s own sukkah. Former Ambassador and current Deputy Minister of Diplomatic Affairs Michael Oren sat with Miriam and Naomi Fuld in their sukkah, and later purchased the image on a plaque for his office. Combining her graphic skills and her fundraising expertise is not something new for Weinstein. Weinstein is the owner of Cedarhurst party planning company Events 360 as well as the cofounder of Couture for a Cause, the charitable organization she heads with Esther Silber Berg. This enabled her to mobilize the fundraiser quickly. In a matter of days, by the eve of Sukkot, the Lion of Zion campaign had brought the Fuld family Go-Fund-Me total over the one million dollar mark. Weinstein hopes to see more of Ari’s visions brought to fruition through the help of his supporters worldwide.